Take a blender and grind the grated coconut along with water …. Extract coconut milk(thick onnam palu/ First thick milk) and filter it (3 cup). Take the cumin seeds in hand and just rub the seeds with the fingers and add this to the coconut milk and keep it aside. Now add some more water and grind again and extract thin coconut milk(8 1/2cup). Wash the rice properly and keep it aside. Heat the uruli or big thick bottomed vessel(if u have nonstick kadai its best) . Add the 2nd coconut milk and bring it to boil in medium flame.Stir occasionally for not to curdling the milk . When it began to boil, pour the rice into it,close the vessel with a lid and cook well. When its 1/2 cooked add the salt …Don`t forget to stir occasionally. ..So when the rice is 3/4th cooked then add the 1st extract of milk with cumin seeds . 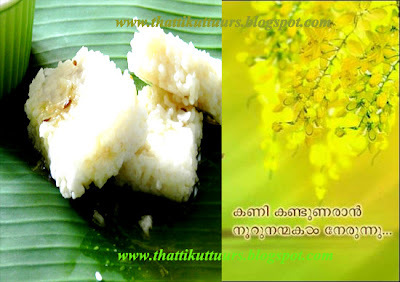 Stir continuously till the rice is cooked and become a thick gravy .Stir carefully coz the water in the milk began to crackle .By this time the oil is begin to come out from vishu katta. So when its done take it from the kadai or uruli and pour into steel plate or banana leaves and fill it fully. When it is cooled down cut into pieces..
nice recipe....great idea for my dinner. I always eat rice.